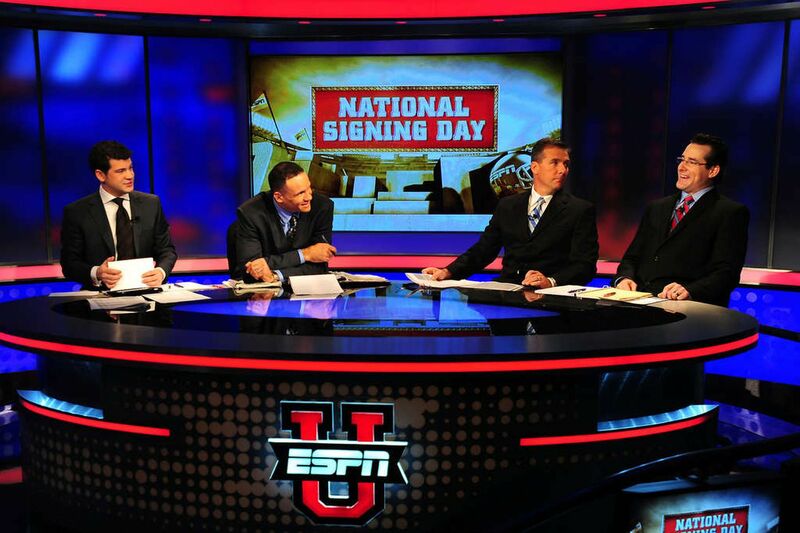 The Comcast-Disney contract expands the reach of the ESPN sports network. This football panel comprised (from left) Lowell Galindo, Robert Smith, Urban Meyer, and Tom Luginbill. It sounds dire, no? Losing access to the college football national championship, an NFL wild card game, and NBA basketball? Why are sports fans always caught in the middle of these battles between a product and its distributor? Live sports is what is keeping cable and satellite companies from imploding. Sports is the only “must-see TV” that can’t be satisfyingly DVR’d or time shifted. So, Verizon warned its customers that Disney was asking for more money (costs that would inevitably pass on to Philadelphia customers) for the same content. All because they want you to pay for the new ACC Network. It seems odd that Philadelphia’s TV market would be caught in the middle of a battle for carriage of a college conference primarily located south of the Mason-Dixon Line, but there is a method to the madness. If the ACC Network can launch with 60 million households or more, they can charge higher ad rates and attract national advertisers. Disney wants two revenue streams from this new company — subscription fees and advertisers. Where is the heaviest concentration of potential subscribers? In the Northeast section of the country, which has a high population density and interest in many ACC teams. Disney’s ownership of highly desirable consumer content (especially live sports) put Verizon customers in a very difficult position. Add to it arguably the most widely watched local news channel (6ABC), and this crosses over to another dimension for Philadelphia viewers. Disney and Verizon scrambled their way to a deal before the New Year. But as someone who has studied the evolution of media rights and its impact on college sports, I found this negotiation between Verizon and Disney deeply troubling. The ACC Network is launching at a time of declining cable viewership. Starting a linear network when most sports media companies are seriously investing in streaming technology seems to make little sense. Yet rather than study the marketplace and try to get ahead of the curve, Disney has asked Philadelphia customers to compensate them for this massive gambit. And, if you don’t, well, thanks for playing. Consumers are limited in their choice of distributors because cities have permitted local monopolies (see: Comcast in Philadelphia). When companies like Disney have a stranglehold over college and professional sports, viewers are truly a “captive” audience in both content and delivery. And, when bundled with an internet package, what options do consumers really have except to pay more? Nationally, there were more than 100 battles between content and distribution companies that directly impacted consumers in 2018. This shows no signs of improving in 2019 and beyond. It’s important that viewers understand how sports media companies are taking advantage of us — and why they are willing to pay the NFL and other leagues billions and billions of dollars to keep us watching. All of us should be concerned about the consolidation of programming into the hands of a few companies; it has the potential to drive prices higher. We rely on competition to increase quality and choice; in this environment, we get the opposite.